I found the single you see before you about a year ago, out in the field, and even though I hadn’t heard it, had to grab it and take it home. 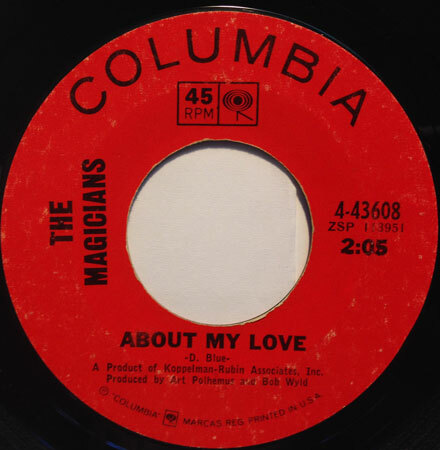 The Magicians were a short-lived New York folk rock group in the mid 60s that released a handful of 45s before dissolving. They’d probably be completely forgotten if not for two of their members, Alan Gordon and Gary Bonner, who went on to write ‘Happy Together’, ‘She’d Rather Be With Me’ and ‘You Know What I Mean’ for the Turtles, ‘Put the Clock Back on the Wall’ for the E-Types, ‘Celebrate’ for Three Dog Night, and ‘Me About You’ (a favorite song of mine) for a bunch of people. Oddly enough, today’s selection was not a band original, but a cover of a tune by folk singer David Blue. ‘About My Love’ was originally recorded in 1966 by Blue in a prime Dylan-folk rock style. The Magicians got their hands on it later that year and whipped a little garage punk heat on it, with some wailing harmonica, pounding drums and twangy guitars. Their’s is a pretty solid reworking of the song, giving Blue’s imitation Dylan a good kick in the pants. The flipside ‘Angel on the Corner’ provides a real contrast, coming across with an almost pop/soul vibe. It’s a cool 45, and as far as I can tell, pretty affordable. Sundazed put out a ‘Best of’ comp by the group in 1999, with all of their single tracks and some unreleased things as well. Today’s selection is proof yet again that you should always dig a little deeper. 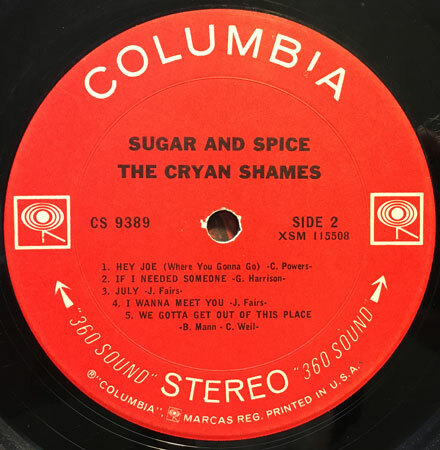 I had always known of the Cryan’ Shames via their big hit cover of the Searchers ‘Sugar and Spice’ and its fantastic, fuzzed-out flipside ‘Ben Franklin’s Almanac’(which I’ve had on 45 for decades). I knew they had some albums, but never found them out in the wild, nor had I heard anything else about them. So, a little while back someone posted a clip of the band covering the Byrds ‘She Don’t Care About Time’. I was very pleasantly surprised, and set out in search of their first album (also called ‘Sugar and Spice’) from 1966. The album featured a bunch of covers (who didn’t record ‘Hey Joe’ in 1966?) and some very cool, very poppy originals, mostly written by the band’s guitarist/singer Jim Fairs. The tune I bring you today is the shortest cut on the album (clocking in at 1:34) and the most interesting. ‘July’ is a fantastic piece of Byrds-esque folk rock with just the tiniest bit of psychedelic feel creeping in around the edges. The group harmonies are tight, and the jangly guitar, played over a rhythmic drone are very cool. The coolest thing about the record is that they manage to add something interesting to all the covers, and the originals are all top notch. 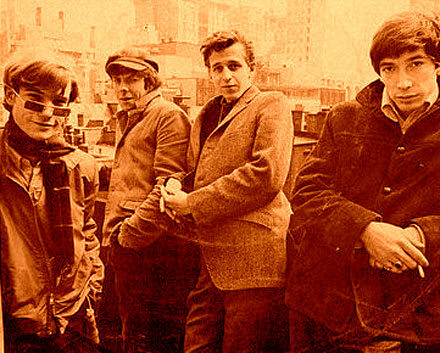 The group (based out of Chicago) went on to record two more albums (the last after many of the original members had departed) and a number of 45s, breaking up in 1969. Though some of their 45s are pretty easy to score, the albums are a little bit harder to find, but (especially in this case) worth it. I have something very groovy and interesting for you this fine day. But first, allow me to point you in the direction of the Funky16Corners 2016 Allnighter/Pledge Drive, in which we offer up a series of very groovy mixes in order to entice you to donate to the operating budget, which keeps Funky16Corners and Iron Leg, their associated podcasts and mix archives up and running. If you dig what you see here (or there, or everywhere) stop by, click on the Paypal link and toss a little something into the hat! 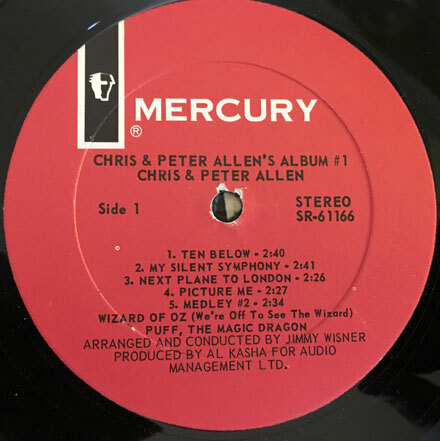 Years ago – and I forget exactly where – someone hepped me to the fact that Peter Allen (yes, Mr ‘I Go to Rio’ and ‘Don’t Cry Out Loud’) had an earlier chapter in his career, in which he was part of the duo ‘Chris & Peter Allen’. Word was that they had an album released in the US in 1968 and it was worth picking up if you were a fan of sunshine/lite pop stuff. I am, so I started looking for it and found it quickly (and cheaply). 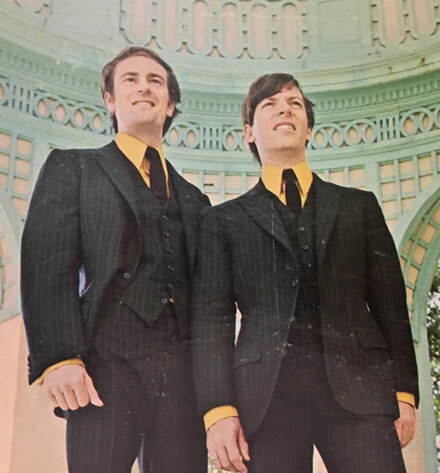 As it turns out, Chris and Peter Allen were neither brothers, nor ‘Allens’, since Chris was Chris Bell and Peter Allen got his start as Peter Woolnough. They got together in the mid-60s, working as a cabaret act in Australia and Southeast Asia. They eventually recorded some 45s for ABC/Paramount and then moving on to Mercury. 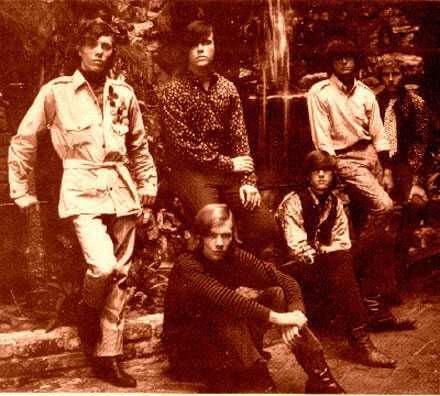 Their sole album, ‘Album #1’ was released in 1968. The feel of the album is more supper club/cabaret than sunshine pop, though a few of the cuts fall under sunshine pop/popsike. There’s even a ‘Wizard of Oz’ medley (with sitar), a take on ‘Waltzing Matilda’ and a very groovy sunshiney remake of the old standard ‘Just Friends’. The best of them is the track I bring you today, ‘My Silent Symphony’. The only track on the album written by the B. Rogona and Billy Barberis (who cowrote Teddy Randazzo’s ‘Let the Sunshine In’, later covered by Georgie Fame), ‘My Silent Symphony’ has all the hallmarks of the kind of dreamy popsike being crafted in the UK around the same time, mixing harpsichord and fuzz guitar with harp, flutes and strings. The Allens’ harmonies often drift into reverb, and the track would fit nicely on any comp of the lighter side of psychedelic pop. The album appears to have been recorded in the US (likely Philadelphia) with Jimmy Wisner doing the arrangements and production. The duo split up soon after Allen’s divorce from Liza Minelli (she even recorded their song ‘Middle of the Street’ in 1966), and Allen wouldn’t resurface on record until his first solo album in 1971. As far as I can tell, Chris Allen never recorded again.